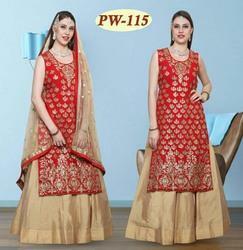 Offering you a complete choice of products which include straight cut heavy long party wear suit, trendy party wear suit, anarkali dress suits with floral embroidery, party wear designer long heavy anarkali suit and designer embroidered kurti with lehenga for festival. Straight Cut Heavy Long Party Wear Suit in Sea Green Silk & Nett Dupatta, Full Embroidered Front Side Of the Kurti.. Sleeves can be attach ( As per your requirement ). any size can be done. Party Wear Designer Long Heavy Anarkali Suit in Pinkish Peach Silk & Nett Dupatta .. Full Embroidered Yoke & Butta work on Bottom Flair.. Sleeves can be attach ( As per your requirement ) Any Size can be done. 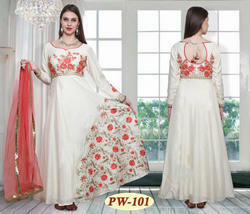 Designer Embroidered Kurti with Lehenga for Festival in Red & Gold Color, Sleeves can be attached, any size can be done.